A look at a few small stories today, from the Dauphiné preview to Andy Schleck’s private victory ceremony, plus new motivation techniques, a new competition in Switzerland and the Italian doping scandal that was supposed to erupt again this week. And more on the stunning image above too. 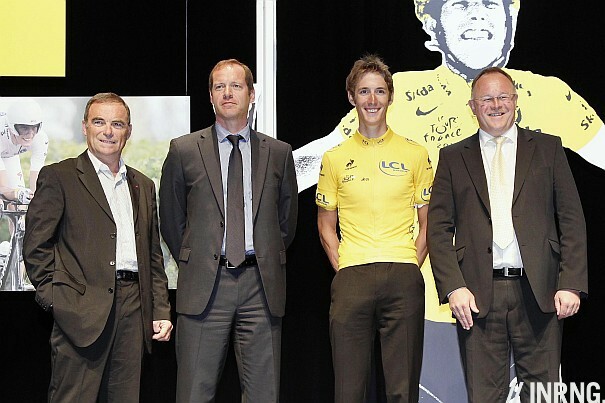 Following February’s Court of Arbitration for Sport ruling for Alberto Contador to forfeit the 2010 Tour de France the race organisers held a discreet ceremony to award a symbolic yellow jersey to Andy Schleck. It was done in Luxembourg and on the eve of the Skoda Tour of Luxembourg will have been covered by the local press and cycling media alike. But with most of the French sports journalists on duty for the Rolland Garros tournament this was a sneaky way to get the matter over and done with away from too much coverage. As a reminder the CAS order required Contador to forfeit the 2010 Tour de France. But not only the result, but the points and prizes too and the same goes for other races like the 2011 Giro (Scarponi collected his trophy a while back). Many results have not been rejigged, for example Bjarne Riis admitted to doping in 1996 but is still cited as the race winner. The difference here is procedural: the CAS has ruled. This sets off a chain of events and every has to comply. But one unknown element is what happened to the money. Under the rules money is supposed to be paid out by the organisers within 30 days but it goes to the national federation who then have to pay the money out. But if there’s trouble – like news breaking of Contador testing positive – the money can be withheld. There is the element of following procedure but the main thing is that the prize money is shared. Does this mean the Astana helpers who were counting on Contador’s prize money lose it and to the helpers of Team Saxo Bank from 2010’s Tour de France, whether riders or staff, now get the money? Nobody seems to know. If you’re on the normal version of this site then look up at the top of the page for a permanent link to the preview of the 2012 Dauphiné stage race… or see http://inrng.com/dauphine. It lists the stages and gives summary information on the race. Once the start list is confirmed I’ll add that plus offer some commentary on who might win. Starting on Sunday 3 June this is a mini-Tour de France and usually an enjoyable race both for its route and racing but also because we can finally see man of the Tour de France contenders racing together. On the morning of each stage I’ll be doing a “Spin” preview too. I know several readers left comments and emailed to say they’d taken out a new subscription to Ride Cycling Review after they sponsored the blog for April. If you haven’t see it yet not there’s a new edition out now and it’s got the stuff you’d expect like a big wrap on the classics but also a look at betting in cycling plus a look an an Indian pro team. From new stories to old ones. The wheels of Italian justice don’t have deep section carbon fibre rims and silky bearings. Instead they grind onwards like wooden cartwheels on some sterrata. For years now the Chief Procurator in Mantova Antonino Condorelli has been investigating an alleged doping ring in the city of Mantova in Italy. I believe Condorelli was going to decide this week whether to press for prosecutions, in other words to stop the investigation and now move to charging. But a terrible earthquake has hit the region and the authorities are rightly busy attending to this disaster. The Swiss tour will feature a new jersey, this one for the first Swiss rider on the overall classification. It’s tempting to see this as bout of nationalism or a way to rig a prize for a local rider. After all the route of the 2009 race was designed to be so flat that Fabian Cancellara could win, which he did. But I actually like the idea because a lot of the media covering these races are national and it gives them something to talk about. Yes the sport is national but celebrating the local rider will help coverage on the ground. Of course the race is also run by sports marketing agency IMG and having a new classification, a new jersey with room for an extra sponsor means more revenue too. There’s a documentary from the 1980s about British cyclist Robert Millar called “The High Life”. A neat film and in one scene a young Allan Peiper is talking about motivation and how some riders respond differently. Some need to be encouraged with care but others need to be shoved up against a wall in order to get a message across says Peiper. Today a manager with Garmin-Barracuda, Peiper’s been part of the team behind Ryder Hesjedal’s win. It seems Johan Bruyneel is trying aggressive techniques in public to motivate the Schlecks, to take them out of their comfort zone. It’s certainly not the first time a manager goes public with criticism. Time will tell if it works but from afar it looks like a dialogue of the deaf. Finally from up against the wall to wallpaper. The Giro d’Italia organisers put a great photo online from the Giro, it’s the one at the top of the page. A large hi-res image is available for free if you want a scenic desktop background for you computer. Just click here for the big version. The image is by Ashley and Jered Gruber who have been working on the Giro and with the Giro. Things didn’t start so well after thieves smashed into their car during the race and stole equipment, including a hard disk with every image they’d snapped over the last few years. That is a stunning photo I must say. I mean the wallpaper of course, not the one of Andy Schleck et al..
Isn’t the total numbers of classification jersey ruled to be no more than four? And if so, has the Tour de Suisse to replace one of its former jerseys or did they only have three in the past? Good point and you are right. There is no young rider’s jersey. When did this rule go into effect? Maybe we were in violation of the rules, but at a UCI event in the US, we had GC, Points, KOM, U23 and 1st American jerseys. It’s for WorldTour, HC and 2.1 races. 2.2 events can have more but this is capped at six jerseys. Thank you for the shorts! Nice stuff, great photo from the Grubers. And a question for you – in the short about TdS you wrote: “But I actually like the idea because a lot of the media covering these races are national and it gives them something to talk about. Yes the sport is national but celebrating the local rider will help coverage on the ground” In the second sentence, did you mean that the sport is international? I truly hope that Andy Schleck can win a TdF under his own steam one day. “Some need to be encouraged with care but others need to be shoved up against a wall in order to get a message across”. Definitely true. The difficult thing is to tell one rider from the other. Julián Gorospe, famously weak-spirited, who lost the Vuelta 83 to Hinault after having been superior to him for 18 days, was always “pampered” by his DS (the same guys running Movistar nowadays), he was never criticised in public. He later went on to become DS himself at Euskaltel, famously bashing Iban Mayo in public in order to motivate him. Does it go to show how he thought he should have been treated when he was a rider? I have to see the Robert Millar documentary, he was one of the most fascinating riders, the last great Peugeot jersey. He was 2nd in the Vuelta (like Froome, only Millar did it twice), 2nd in the Giro, and 4th in Tour (matches Wiggins). Still the greatest British rider. Also feel bad about the theft. But can not understand that all their work was stolen out of the car. If you are a pro, you have a backup. Can imagine it was their work of this Giro until that moment. What is up with that! Not being able to account for TDF prize money. How can they not have a process for recouping legally revocable prize money? The organizational skills to put on a TDF are epic and the envy of all other stage race committees, yet no legal process for misappropriation of prize money by a pro team caught with doped rider that ends the race with the yellow jersey! As always //inring is my first stop upon sitting down at my computer. Not just the Grubers. Australian photographer Veeral Patel’s equipment also stolen from his car. Seems someone was targeting photographers at the Giro. That’s right and the race organisers stepped in to help them. The jersey – They gave him a 2012 version (with the Coq Spotif logo and odd collar) instead of a 2010 Nike one. Odd. The money – I’m not sure that “legally revocable” is correct. Don’t bookmakers have rules to cover winnings from subsequently changed results? Pretty sure they pay out at the time and that’s it. The bowl – No trophy for Andy? I know that Landis kept the bowl he was presented with, as in the Kimmage interview he talks about smashing it on the floor one day. I also remember a comment from the Giro director that he was annoyed about having to find a new trophy (for Scarponi). Does anyone know what Scarponi was presented with? Trophy, pink jersey, big cheque or nothing? Hinault looks relaxed and comfortable as usual with the foo foo.